Word FRENZY makes a great party game. You can play in one large group or on multiple tables using Word FRENZY Party Rules. Our 32 Player party set allows you to play with up to 32 players on 4 tables. A Word FRENZY party is perfect for a wide age group, friends and strangers alike. Players move from table to table so players will play with and get to know everyone at the party. No one will fill left out or intimidated because the fun of Word FRENZY is the fast, energetic game play. Everyone will be laughing, talking and getting crazy in no time. At a Word FRENZY party, everyone feels like a winner becuase it is so much fun to play. You may download Word FRENZY tournament rules and extra score sheets in our download area. 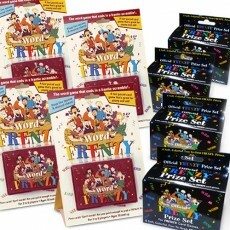 32 Player Word FRENZY Party Set includes 4 complete Word FRENZY Card Game Deluxe sets and Party rules. 4 - 50 sheet score pads printed on both sides for dozens of games – plus, if you do run out, you canprint your own score sheets by downloading the score sheet file on our download page. All packaged in a 3 high quality, compact game boxes. 4 FRENZY Prize Sets each including 6 colorful foam block FRENZY Prizes that won't harm players or furniture. "Word Frenzy is a RIOT! It is fast paced, crazy, can get loud, but so hilarious! We are considering purchasing gloves for the players next time this gang plays, however, because a couple of the players have some pretty good nails going and they gave battlescars to other players, who were trying to also grab the prizes at the end of the round... which became a battle in and of itself, making for more laughter to go around." "Our Game Gang all agreed this game is on our TOP THREE - Must Play list !! You can't get any higher on the list with this gang !! Way to go Word Frenzy!!!"